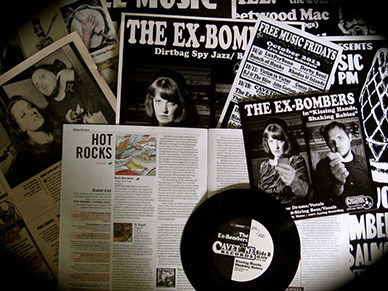 Synopsis: The Ex-Bombers perform for in various seedy locations in the “triple C” triangle of Columbia, Mo., Charleston, Ill., and Chicago. Dive bars, college radio, and punk rockers all got a dose of dirtbag spy jazz. 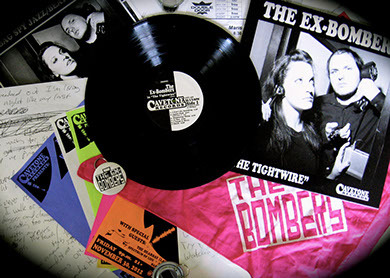 Synopsis: The Ex-Bombers, armed with their first LP, continue the “triple C” triangle and learn the joys of Kentucky, Wisconsin, Ohio, and other delights. 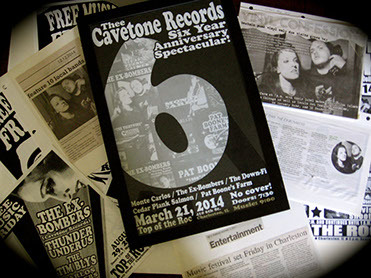 Many rock shows, many quality esoteric venues. Highlights: Releasing the 7” anti-single “Kissing Hands, Shaking Babies” / Extended trips to new midwest locales. Thee strange: Playing beatnik punk at 7 a.m. on a morning show in Champaign, Ill. Everyone involved recognized the strangeness, everyone involved made it wonderfully strange. Honorable mention: Playing the City Museum in St. Louis. Someone juggled fire during the set and someone bought cotton candy. 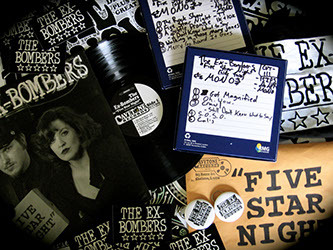 Synopsis: Armed with an album and anti-single, The Ex-Bombers now tour all over the Midwest in interesting venues, dive bars, speakeasies, and art galleries. The year also provides the first foray out west to places like Denver. Back in Charleston, The Ex-Bombers' following gets zealous. Thee strange: While playing after a performance of “Hedwig and the Angry Inch” underneath Colosseum seating in Muncie, Ind., Keri leaves her drums mid-song wielding a riding crop and returns with theatre patrons. Synopsis: A new year brings The Ex-Bombers a new album and extended tours in extended types of places. Live performances at venues, record stores, college campuses, art galleries, and swanky bars took place all around the greater Midwest as well as an extended run in the South. Thee strange: On Thee Southern Exposure Tour, the film noir pop band plays extended sets of two and three hours. This culminates with a four hour set above the streets of downtown Pensacola, Fla. for Gallery Night. There were also tacos from an Airsteam.